Dental implants are an ideal solution for replacing one or more missing teeth, and can often be a superior choice when compared to conventional dental bridges or dentures. Dental implants look and act like natural teeth, and because they maintain bone mass, dental implants can help prevent additional tooth loss, as well as the sunken-face appearance associated with missing teeth. Dental implants can also be used to secure appliances such as dental bridges and dentures. Implant-secured dentures virtually eliminates the stability problems associated with conventional dentures while still allowing the dentures to be removed for hygiene purposes. A dental implant consists of a titanium fixture that is surgically placed in the jawbone, where it replaces the natural tooth root. Titanium is a “bio-compatible” material, meaning it will not be rejected by the body. In a few months, the dental implant securely fuses with the bone (called “osseointegration”), allowing it to withstand biting and chewing forces just like a healthy, natural tooth. Implant surgeries are performed at Dental Arts by Dr. Dario Gonzalez. Dr. Gonzalez is a skilled periodontal surgeon, as well as a clinical professor of periodontology at Boston University. He has performed implant surgeries at our practice for many years and his results are excellent. His calm demeanor and confident chairside manner is frequently commented upon by our patients. The primary limiting factor in implant dentistry is the amount of bone available to receive and support the dental implant. In some cases, if it is determined that a patient does not have enough supporting bone to sustain a dental implant, bone grafting procedures may be considered. The presence of periodontal disease or certain medical conditions may preclude the ability to perform successful implant surgeries. This consists of a consultation with Dr. Gonzalez, who will examine your mouth and take any necessary x-rays. Sometimes CT scans may be prescribed as well. He will determine if you are a good candidate for dental implants, and if so, will discuss the treatment specific to your case and schedule the surgical appointment. This is the surgical appointment. While your mouth is completely numb, a small incision is made at the implant site to expose the bone. The surgeon then prepares the site to receive the implant. Once the implant is secured, the gum is sutured closed over the implant and a small “healing collar” is placed for easy access to the implant when it comes time to restore it. 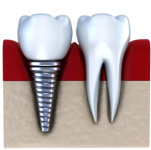 The implant is left undisturbed for up to six months to allow it to osseointegrate, or fuse with the bone. If the implant is in a visible area of the mouth, a temporary prosthesis can be made and worn during the healing phase. Once the implant has successfully integrated with the bone, your dentist removes the healing collar and takes a specialized impression that is sent to our ceramics laboratory. The healing collar is replaced, and the final appointment is scheduled. At the final appointment, your dentist removes the healing collar for the final time and inserts a custom-designed “abutment” in its place. The custom abutment is either a titanium or ceramic post that is designed to fit precisely into your implant. If the implant is to restore a single tooth, then a custom ceramic crown is attached to the abutment to complete the restoration. If the implant is to secure a denture or bridge, then further steps are taken for these prostheses.